Iran's Foreign Minister Mohammad Javad Zarif immediately blamed the attack on regional countries and their "U.S. masters"
In this photo provided by the Iranian Students' News Agency, ISNA, Iranian armed forces members and civilians take shelter in a shooting during a military parade marking the 38th anniversary of Iraq's 1980 invasion of Iran, in the southwestern city of Ahvaz, Iran, Saturday, Sept. 22, 2018. Gunmen attacked the military parade, killing at least eight members of the elite Revolutionary Guard and wounding 20 others, state media said. 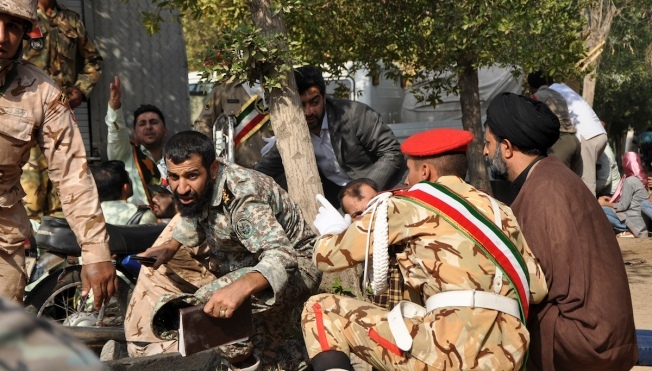 NBC News reports gunmen attacked an annual Iranian military parade Saturday in the country's oil-rich southwest, killing at least 24 people and injuring more than 53 others, the deputy governor of the Khuzestan province said. At least eight of those killed were members of the country's elite Revolutionary Guard, local media reported. Foreign Minister Javad Zarif vowed Iran would "respond swiftly and decisively" to the attack, which he said claimed the lives of children and journalists. "Iran holds regional terror sponsors and their US masters accountable," he said on Twitter.